LogiNets Oy is the representative of Swedish Cami Gruppen AB’s construction site solutions in the Finnish market. 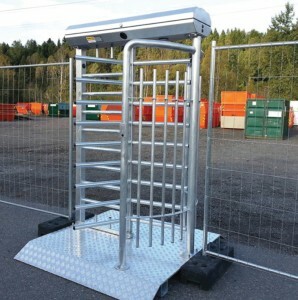 A robust and cost-effective turnstile for access control of personnel traffic on construction sites. Sierra Nevada is a cost-effective, lightweight, fully welded steel-grade sliding gate solution. Sierra Nevada can withstand harsh work and weather conditions and can be lifted and moved by crane or forklift truck. Available as both manual and motorized. The Himalaya-folding gate is a fast-opening and spacious vehicle gate for construction sites. The gate takes less space than the sliding gate, due to folding doors. The fully welded steel structure of the Himalaya gate is designed to withstand the tough working and weather conditions of the North. The door can be lifted and moved by crane or forklift to a desired location on site. Power on, and the gate is ready for use. The Himalaya-folding gate is delivered pre-installed and tested. Gate opening and closing works with VALTTI reader and with company-specific access control cards. As a safety guarantee, the gate is equipped with a power transmission and safety system, according to Nordic standards. Watch the video on how the gate opens and closes. Need help with choosing the right solution? Contact us and request a quote. Our experts will be happy to help.